Before the marathon I made a few specific trainings and the missing part it was just checking the lungsμscle during a race. As this year I am riding individual I have more flexibility and “free hand” to choose the races, but at the same time need to carry about all the financial costs. 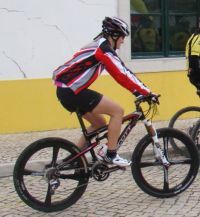 Because of that I am taking part mainly in the events in Lisbon area, which fortunately has quite much to offer. The idea for the race was quite simple. Ride strong, do not focus on the result and saving the power, do not hide from the wind, test some limits but like always be careful and do not provoke stupid crashes. I was counting at the same time for “sharing the track” with Ana, but she decided not to take part in the race. In this case with fully training purposes I have competed and followed the guys. I found marathon track really good choice – a lot of rolling parts but mixed with some technical sections, single tracks, few uphills. It was possible to test the reaction of the legs for different “speed levels” and this was exactly what I looked for. At the same time marathon was not too long – 65km, around 2.5h – so it was not making to big damage for the body. Fast recovery process and let’s go for Alte!